Subaru is prioritizing spending on electrification over other technologies, like autonomous driving and connected cars, as it races to bring a plug-in hybrid model to market next year and an all-electric vehicle by 2021. Subaru Corp. is considering electric versions of its existing models for the carmaker's first foray into the technology, as it joins peers around the world in pouring cash into battery-powered vehicles amid tightening emissions rules. The Japanese company, which plans to make record investments in research and development in this financial year, is weighing installing electric powertrains in current models rather than designing an all-new car, CEO Yasuyuki Yoshinaga, 63, said in an interview. The move would allow Subaru to capitalize on its reputation for safety while eliminating the need to partner with another automaker, he said. Such a strategy would contrast with the approach of other manufacturers like Daimler AG's Mercedes-Benz. The luxury-car maker has bundled its electric-vehicle technology, including charging boxes and energy storage, under the EQ sub-brand, giving it more visibility to better compete with Tesla Inc. Yoshinaga sees advantages in sticking with a single nameplate. "If there's already an attractive Subaru model, for example the XV crossover, and if a customer in Beijing wants one but is only allowed to buy an electric vehicle, if there's no electric version then he can't buy it," he said at the automaker's headquarters in Tokyo. "Providing the choice of an EV means the customer can still desire the same Subaru." Subaru is prioritizing spending on electrification over other technologies, like autonomous driving and connected cars, as it races to bring a plug-in hybrid model to market next year and an all-electric vehicle by 2021. The company is budgeting 134 billion yen ($1.2 billion) on research and development in the 12 months through March 2018, more than double what it spent in the year ended March 2014. Subaru's spending on r&d is still less than the big Japanese automakers that are also stepping up efforts to produce EVs. Toyota Motor Corp., which owns a 16.9 percent stake in Subaru, plans to spend 1.05 trillion yen on r&d in the current fiscal year and Honda Motor Co. will invest 750 billion yen. Toyota aims to introduce a global EV model and Honda unveiled an all-electric version of its Clarity sedan last month. Honda has also said it plans to set up a joint venture with Hitachi Automotive Systems to develop and produce motors for EVs. While Yoshinaga said he's not against a partnership for the all-electric vehicle, simply adding an electric powertrain to one of Subaru's existing vehicles would make a tie-up unnecessary. Instead the key will be the selection of suppliers for the battery and motor. A decision on this will have to be made in about a year, he said. He mentioned Panasonic Corp. and Samsung Electronics Co. among possible partners. The XV crossover, called the Crosstrek in the U.S., and the Impreza sedan were awarded the top prize this year with the highest score ever in the state-run Japan New Car Assessment Program, which included tests for crashworthiness and pedestrian protection. 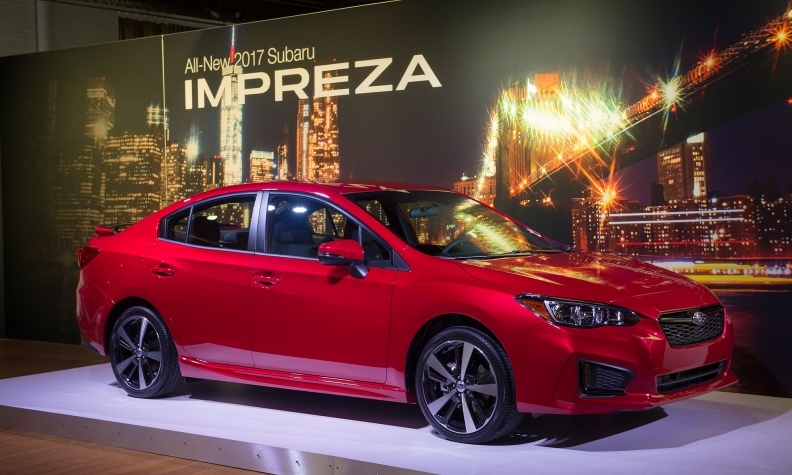 The Impreza also received the Insurance Institute for Highway Safety's highest safety standard this year in the U.S.
Subaru's EyeSight driver-assist system comes a close second in terms of R&D spending, although Yoshinaga said he would seek to limit any increase in the price of the technology to enable the carmaker to offer the same safety suite across all models. EyeSight is the first driver-assist setup to use only stereo cameras to detect objects such as vehicles, pedestrians, cyclists and motorcyclists, according to the company. It's due to be updated this year with added functionality for autonomously following a car on congested highways, and a further upgrade in 2020 plans to add fully autonomous highway driving, including the capability to change lanes. The automaker is considering Autoliv Inc.'s cameras for EyeSight as it looks for options beyond Hitachi Automotive, which has been a supplier for almost a decade, people with knowledge of the matter said this month. Subaru needs to cast a wide net when looking at suppliers to find the best balance of quality and cost, Yoshinaga said in response to a question about the carmaker's choice for technology vendors including the EyeSight system. The company continues to increase its relationships with overseas firms, he said. In the area of connected cars, in particular, the CEO said he favors partnerships with companies in the U.S. because the technology there is more highly developed. "We need to work with parts makers on joint development right from the start," said Yoshinaga. "If we don't, we won't be able to keep up in this era of rapid change."